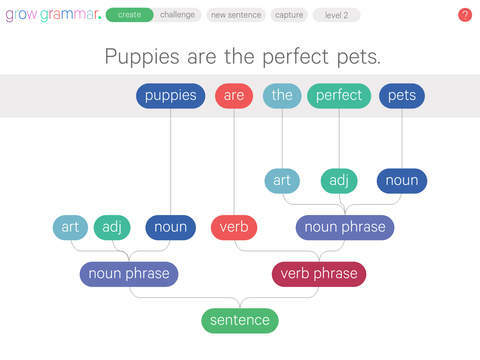 An English Language app that helps children learn about the structure of sentences and how to construct and deconstruct them. There are many elements in the app that aid young people in becoming more proficient in their grammar knowledge and would sit as comfortably in the home for individual use as it would in the classroom for group or solo work. This app has been developed with the American Core Standards in mind however there is certainly enough about this app to make it useful in country where young people want to become more proficient in the English Language especially concerning grammar and the construction of sentences. From looking on the developer’s website there are lots of small chunks of information to help build up an understanding that they are knowledgeable in this area and this adds a lot of weight to the quality of the app. Also on the website are videos explaining how a user can get the most out of the app with explanations on how the app works and all the elements within it. On loading up the app you are given a tutorial on how the app works and how the user can build sentences and even gives some examples of these sentences. You immediately notice that the layout of the page is extremely clean and slightly clinical, giving it a definite education/learning feel. This isn’t to say this is a bad thing and that it detracts from the learning, more that there are not extras on the screen that might themselves distract learning. The look and feel also fits perfectly well with a slightly older audience. The content is above lower primary and so the look and gameplay would invariably be different. 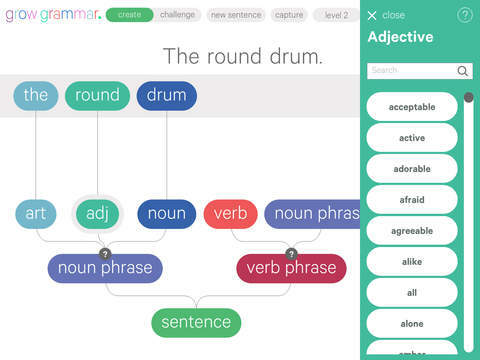 Through the examples the app shows how a simple sentence is broken down in its composite parts such as noun and verb phrases and then articles, adjectives, nouns and verbs. It does this by showing the links through a simple line connecting each word in the sentence to the correct grammatical feature such as noun or verb. In looks it is very similar to looking at a drawing of family tree and just like a family tree it shows the roots of each of the words. Once through the tutorial the user can decide to tackle two different ways of utilising the app. The can decide to simply create sentences of to enter the challenge mode where they are given a sentence and then have to deconstruct it back to the root. Each of the different options is equally good at helping children to understand how a sentence is put together and what all the different grammatical aspects of a sentence are. 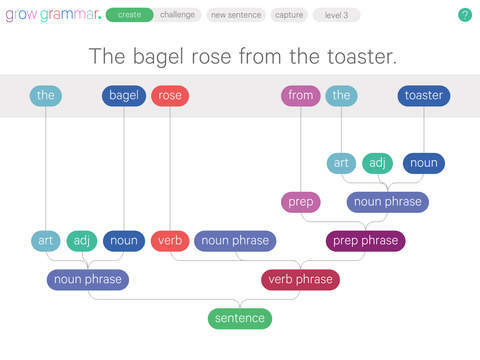 In the create option there is more flexibility in being able to play around with the construction of sentences and would probably suit someone who wants to improve their grammatical knowledge through experimenting and with 4 different levels, getting more complex as they work through, there is certainly a lot of learning that can go on. The challenge option has a more rigid structure where the user works through six sets of five different sentences over the four levels in the app. 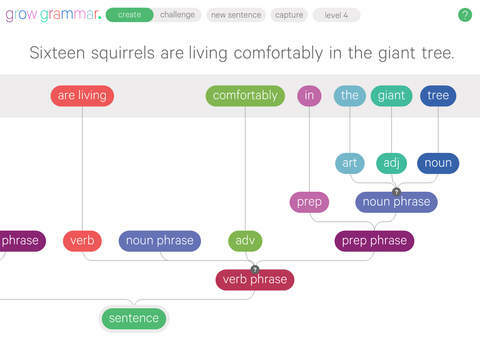 As you would imagine the sentences get more complex as the user works through the levels and this an excellent way to not only challenge the individuals but also if being used in an educational setting to differentiate between the users depending on their prior knowledge and proficiency. At any point in the app the user can capture the sentence they are working on or have completed so they can use it at a later date and this also allows an educator to keep a track of the understanding of the individuals or groups using the app. In the top right hand corner there is also a question mark which allows the user some extra guidance if they are struggling with anything in particular. The main content of the app is run completely from one page and this certainly adds to the usability of the app meaning there is no back and forth between pages. Again this is definitely in keeping with a more mature app for a slightly older child to use. Overall this is a good app for helping young people gain more proficiency in grammar which in turn has such a big impact on their overall literacy abilities.